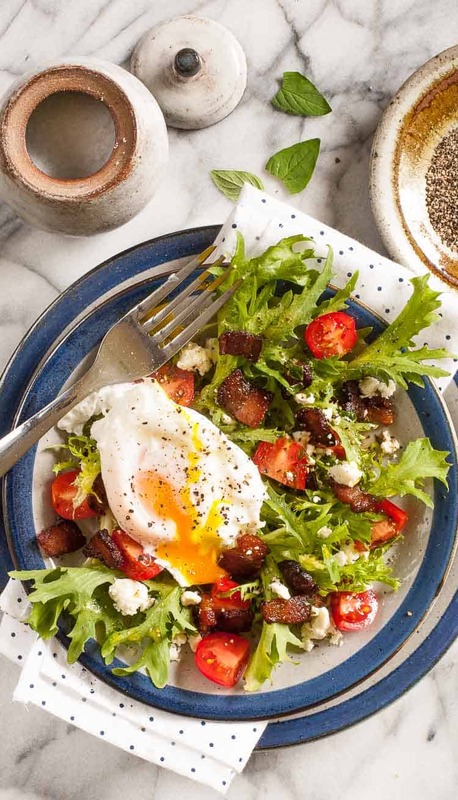 Curly endive lettuce salad with bacon and a poached egg is a take on a classic French bistro-style salade frisee. France. Never been there. I’m not crazy about flying. I have heard that it is a cool place to visit. Three of our kids have been there. MaryJo finally got there last year. Google maps street view is about as close as I’ll ever get. I can imagine a French bistro, a small cafe, possibly with outdoor, streetside seating, where you could go have lunch, have a glass of wine, and order Salade Frisee. Or in our case, curly endive lettuce salad. 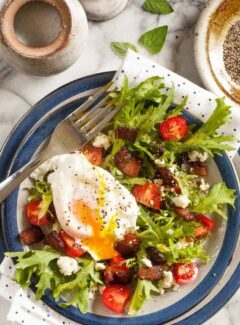 Typically, it would be a plate with a handful of lettuce, drizzled with a vinaigrette, possibly a balsamic vinaigrette, with crunchy, handmade croutons, bacon, a soft-boiled or poached egg, finished off with shaved gruyere cheese. Sounds simply wonderful. and has chickens for eggs. And she has also spent the most time in France, so she’s seen this before. Backpacking through France for a month, staying in Paris for a semester of school, and various other trips. For this salad, I mixed up a simple vinaigrette of olive oil, red wine vinegar, chopped fresh oregano, and salt and pepper. I browned up a strip of thick cut bacon, sliced some grape tomatoes, and added some crumbled feta cheese. Then just poached an egg for 3 minutes and plopped it on the top. 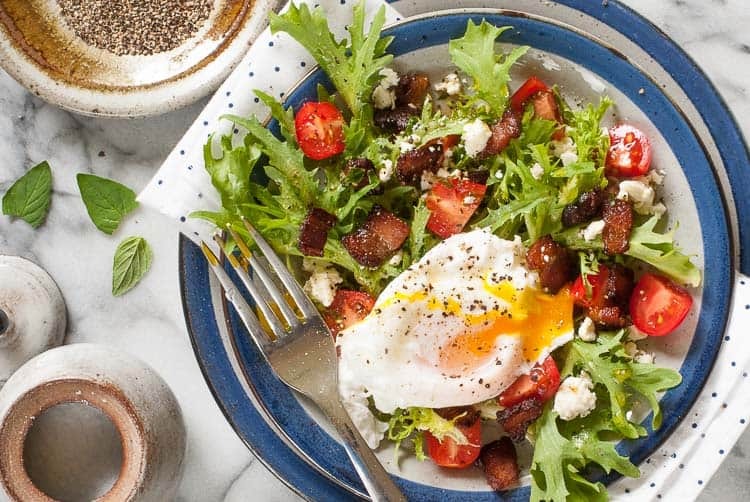 The slightly bitter taste of the lettuce pairs well with the savory flavors of the bacon and egg. Try this salad for breakfast or lunch and pretend you’re sitting in a cafe in the French countryside. 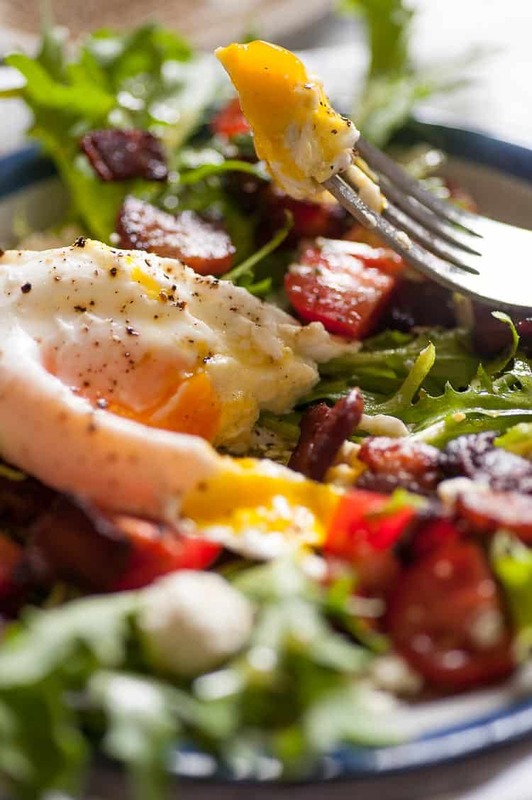 This salad is a tasty breakfast or lunch item and is a take on a French Salade Frisee. Chop the bacon strip into pieces and brown in a small skillet. Place the cooked bacon on a paper towel to absorb excess oil. Poach the egg in a skillet or saucepan with about 1 1/2" of water brought to a simmer on the stove. Crack the egg into a small bowl and carefully lower it into the water. Cook for 3 to 3 1/2 minutes for a runny yolk. Remove with a slotted spoon and use a paper towel to dry off some of the water. Assemble the lettuce on a plate or shallow bowl, add the bacon, tomatoes, and cheese. 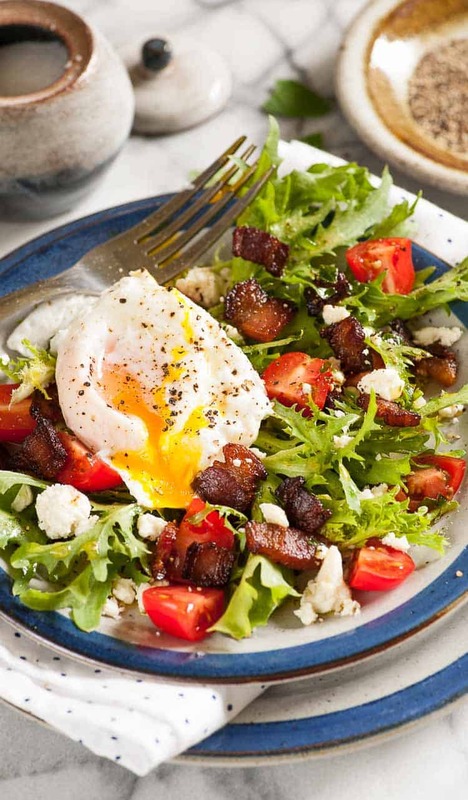 Drizzle with the vinaigrette and place the poached egg on top. Salt and pepper as desired.